A Borders town has become a major contender for the next installation of super-fast broadband in the UK. Innerleithen has broken the vital 1,000 vote barrier in BT's Race to Infinity. It puts it into fifth spot in the poll, with more than 71% of the local population having registered their interest in receiving the service. The five UK exchanges with the highest percentage of votes - subject to a minimum of 1,000 votes - will get an upgrade by early 2012 at the latest. It emerged last month that a Borders village had become the first place in Scotland where every resident had voted for super-fast broadband. The whole 47-strong community of Abbey St Bathans had registered with the Race To Infinity. 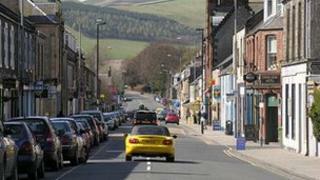 Now Innerleithen is in a strong position to secure an exchange upgrade in the next two years. Leading the way are Blewbury in Oxfordshire and Caxton in Cambridgeshire, with more than 86% of locals voting for the service. The Scottish Borders town has a narrow lead over sixth-placed Whitchurch in Hampshire. No other Scottish site currently features in the top 10 places, with voting due to close at the end of the month.